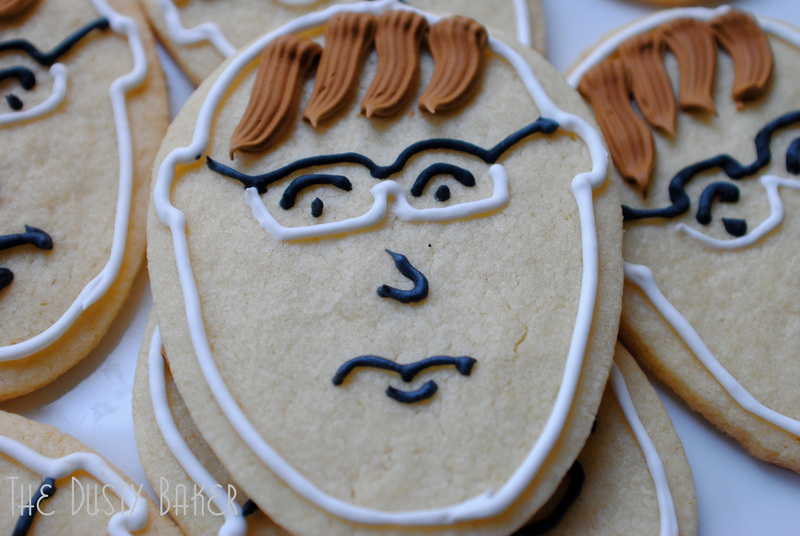 Cookies of my boyfriend's face! And gluten-free! 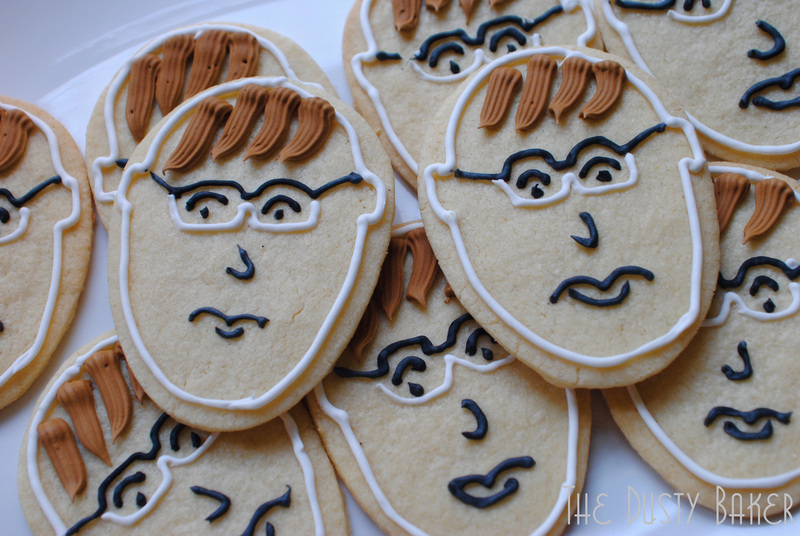 What’s better than flanking a birthday cake with cutout cookies of the birthday boy’s face?!? Nothing! I had been worried that the cookies in reality didn’t match the brilliant ones in my head, but when my roommate walked into the kitchen and burst out laughing, I knew I had at least achieved the right effect. This past weekend was insane: I managed to race back to Connecticut after my week of rehearsals to work in my family office, then flew to NYC and made some gluten-free cookies I’ll soon be supplying to a cafe, attended a beautiful dinner to cheers the 30 years of one of my oldest friends, ran down to cut the cake wrapped in the boyfriend’s face, danced my heart out in a club, ran down Avenue A in the rain at 4am and made it back to the Hamptons for our first run-through yesterday. Yes, I dropped a few lines in this rehearsal. But overall it was a very fulfilling weekend. But, wait. When did I make these cookies?! A few weeks ago I made Saveur’s Classic Sugar Cookies recipe, being able to cut and ice them easily for a Jesus Christ Superstar Benefit. So I figured it was time to make them gluten-free for the festivities. But I knew I wouldn’t be in my kitchen at all this week, being out of town in a show, and so would have to make them in one precious evening in my apartment last weekend. They worked! Rather easily and with little alterations, I used Saveur’s recipe and piped them with royal icing. Then they sat out overnight before being refrigerated for the week. Yes, they were not as fresh as they might have been. But after a soft thawing they were still firm and smooth. Honestly, the hardest part was not sharing or posting these pictures until the celebration – they made me laugh all week! To make the sugar cookies: I used a very basic gluten-free blend that I make of 1 part quinoa flour, 1 part arrowroot starch and 2 parts white-rice flour. For each multiplication I add 2 tablespoons of tapioca starch and 1 teaspoon of xanthan gum. So, for this recipe I blended 1 cup of arrowroot, 1 cup of quinoa flour, 2 cups of white rice flour, 4 tablespoons of tapioca and 2 teaspoons of xanthan gum in a container and then shook to combine. In general I find this to be a great basic flour and keep it on hand. I then used Saveur’s recipe to the last note, replacing equals parts of the white flour with this flour blend. For notes and tips on making consistent, beautiful cookies with royal icing, check out my Cookies For Jesus Christ (Superstar) post. You make great cookies! Yummy!